Today's book craft is a yummy, sweet and super magical one! Oh, and did I mention it is unicorn themed too!! So, what's with all the magic today I hear you cry? Well, that my friends is because it's National Unicorn Day today!! Yes, you heard me correctly. There is actually a day dedicated to the magic and wonder of unicorns and `I'm shouting it out loud and proud. Oh, I'm not ashamed to admit that I'm cringingly obsessed with anything magical or mythical and unicorns most certainly come under that bracket. 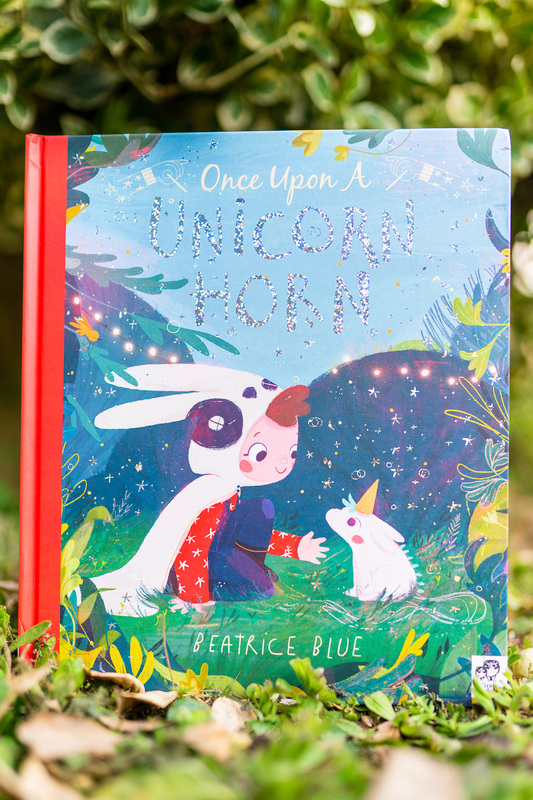 The book that we are using for today's craft is "Once Upon A Unicorn Horn" by Beatrice Blue. We have kindly been gifted this beautiful title from Quarto Knows to celebrate today's sparkly day. This story is a heartwarming tale about a very kind little girl called June. June lives in a magic forest and each day she loves to explore and adventure in the woods. One day June stumbles upon magic horses learning to fly. All that is except one little horse who seems very sad. The tale then goes on to tell how June tries to teach this little horse to fly but alas fails and they both end up very sad indeed. However, with a little magic and love, June and her parents come up with a very sweet solution. Can you guess what happens? I won't spoil it for you but let's just say that today's craft may be a tasty hint for you. This book has been loved and read many times by my little ones. It has made it to the top 10 of their favourite bedtime stories and I can't say I blame them. This story is beautifully written, evoking emotion and delight in equal measure. The imagery is super on trend right now both bohemian and colourful and the pages burst with magic, family, love and creativity. This tale is a true must-have for any unicorn lovers out there. Now, we've read the book it's time to get our teeth stuck into (literally) the tasty craft in hand. Food colourings if you choose. We used 1 tsp beetroot powder to colour the 'strawberry' flavour. 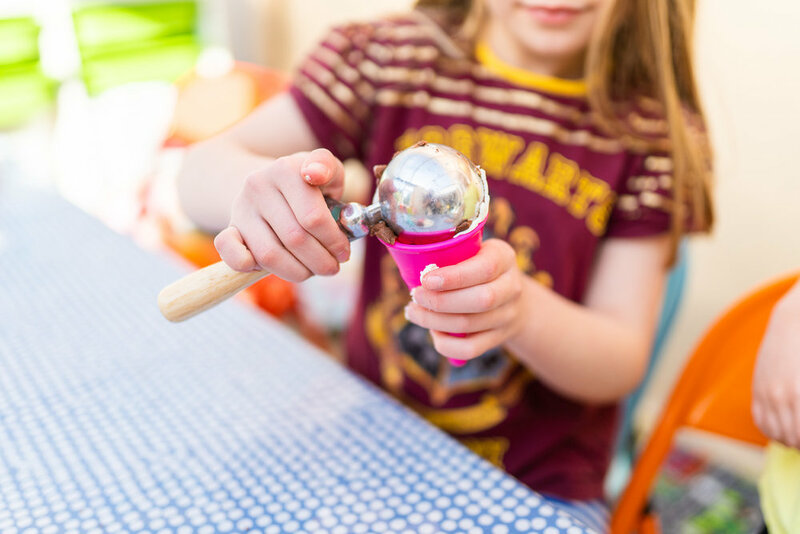 Mix together your 1 cup of pre-made icing with your icing sugar and combine first with a wooden spoon and then with your hands. You may find it easier to cover a chopping board with a thick layer of icing sugar and knead it like you would bread dough. Make sure to add in your colouring before combining fully. I wish that I could tell you that my two didn't eat more than they played with but that would make me a fibber! They did, however, after eating more sugar than should ever be deemed sensible had so much fun playing with this craft. This is a great dough to make if you are worried about your child putting things in their mouth. However, I would advise always being present and monitoring how much goes in! 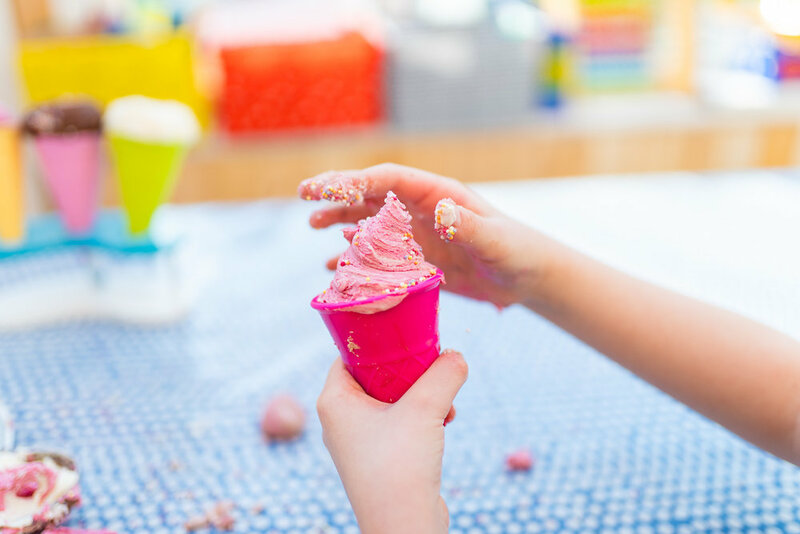 This edible ice-cream play dough is a sensory bonanza. The smell is so sweet and really helps to support their role play. They feel like they are genuine ice-cream sellers as they are using real foods. I love to use real-life examples as often as I can in my little ones play and this craft is a great example of that. I'd love to hear how you all get on with your dough! Please don't blame me if your children eat an obscene amount of sugar though and spend the afternoon bouncing off the walls! Please. Enjoy your day friends, I hope it is full of more magic and sparkles than a unicorn horn!